Traditional handcrafted Thai rice basket boxes. Hand woven bamboo is used to create stunning storage baskets and decorative rattan containers which are then expertly hand painted by local Thai artists. These baskets are traditionally used in South East Asian homes to store rice. They are also ideal as kitchen storage canisters to store pasta, flour, grains, and other dry food goods.These decorative boxes will add a lovely Asian accent to your kitchen counter, or any room. Handmade and hand-painted decorative containers by our very own rural Thai artisans From Chiang Mai, Northern Thailand. We offer many styles, colors and sizes. Please Note: Due to the natural origin of handmade and the materials used please expect 'slight' differences in the color, pattern, shape and finish of the item. We will ship your order within 3 days if the items are available but If we do not have in stock it may take up to 3 weeks to create because these items are original handmade. Please contact us before purchase if you have a specific date for delivery. Traditional handcrafted Thai rice basket boxes from Chiang Mai, Thailand. Perfect for Home decoration or ideal to put small items in for storage, such as teabags, rice, pasta and other dry food goods in the kitchen or cotton balls in the bathroom. 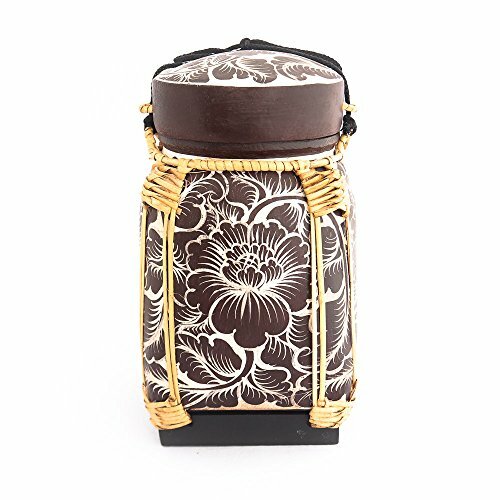 Handmade and hand-painted decorative containers by our very own rural Thai artisans with providing fair trade. We offer many styles, colors and sizes.